Carve a medium pumpkin with a simple face. Triangles, circles, squares and ovals are good choices. Re-insert the face pieces, making sure they can move easily out of the pumpkin. If the pumpkin has thick flesh, you may wish to cut away the back of the pieces so they are lighter/weaker. Poke or drill a small hole in the back of the pumpkin so you can insert the wire sparker. Insert the sparker and test it to make sure it works. Put the water in the cat food or tuna can and set the can in the pumpkin. Drop the calcium carbide chips into the water and replace the lid of the pumpkin. Allow about a minute for the acetylene to build up. Be sure the face of the pumpkin is facing away from you and that your audience is a safe distance from the demonstration. You may wish to wear ear protection. Goggles and a lab coat are recommended. While holding down the lid of the pumpkin (with an oven-mitted hand), spark the sparker. This reaction is used in the commercial manufacture of acetylene and for carbide lamps, which are used by miners in some areas. This demonstration is best performed by a chemistry teacher or other adult experienced with chemicals or pyrotechnics. It is not a suitable project for kids to try. You'll likely need to order calcium carbide through a chemistry or educational supply store or else buy it online. 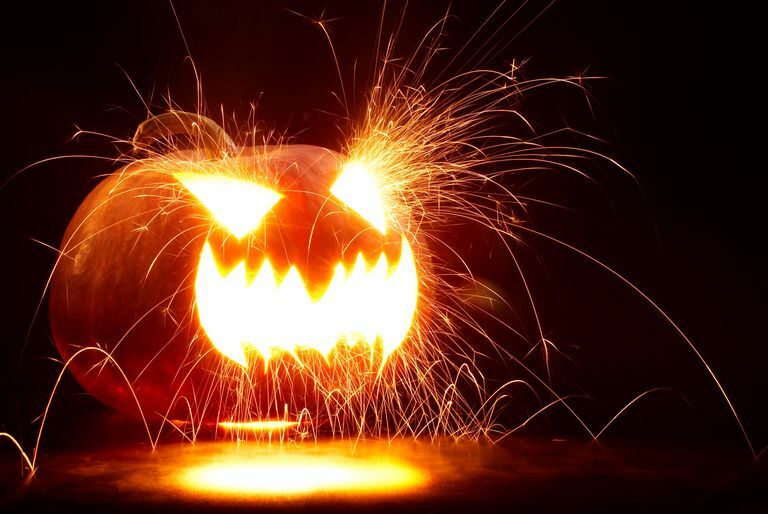 Remote ignition of the acetylene is safer than holding the pumpkin and striking a sparker, though you'll want to secure the lid of the jack-o-lantern so that it won't simply blow off, leaving your pumpkin uncarved. If the pieces of the face are not loose, either the pumpkin will explode or else the explosion will be contained and the pumpkin will be uncarved. This is also a safe version of this project which uses carbon dioxide gas to blow out the jack-o'-lantern face. Although carbon dioxide can be compressed to where it explodes, using a plastic bag to contain the gas provides enough pressure to produce the desired effect without the risk of injury.